New York City, 1972: Bobby Comfort and Sammy 'the Arab' Nalo were highly skilled jewel thieves who specialized in robbing luxury Manhattan hotels. (They once robbed Sophia Loren's suite, relieving the Italian actress of over $1 million in gems.) With the blessing of the Lucchese crime family, their next plot targeted the posh Pierre Hotel-host to kings and queens, presidents and aldermen, and the wealthiest of the wealthy. Attired in tuxedos and driven in a limousine, this band of thieves arrived at the Pierre and with perfect timing, they seized the security guards and, in systematically choreographed moves, they swiftly took the night staff-and several unfortunate guests who happened to be roaming around the lobby-as hostages. 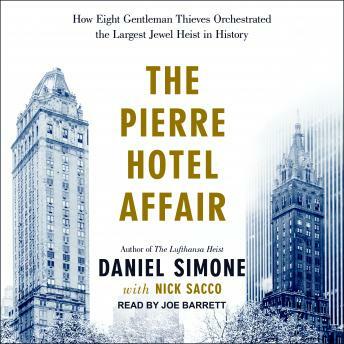 The deposit boxes inside the vault chamber are plundered and, after the intruders have held the Pierre under siege for almost two hours, the gentlemanly thieves depart in their limousine with a haul of $28 million. But then matters begin to deteriorate. Comfort, Nalo, and their partners begin to double and triple cross one another-two absconding to Europe with the bulk of the booty while three are murdered by their former associates.